Mazanec: A Czech Easter Tradition Struggling To Survive In The U.S. : The Salt In the Czech Republic, mazanec, a Czech Easter bread, is like the turkey to America's Thanksgiving. But in the U.S., those who make this bread are struggling to keep the raisin-filled tradition alive. 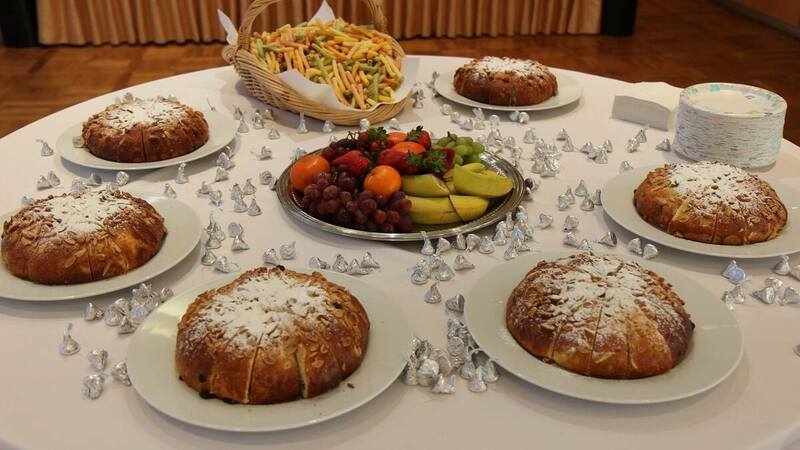 On the weekend of April 8, the Czech Embassy in Washington, D.C., made mazanec as part of an Easter celebration. Stick the word "bread" behind my last name on a Google search. Go ahead. Do it. 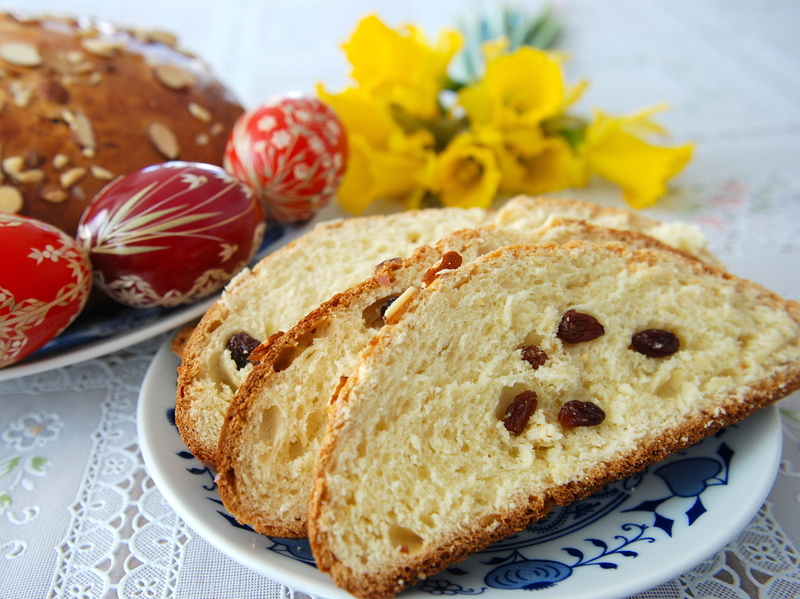 What you'll find is a Czech food tradition rooted in Easter: a Czech Easter bread. Mazanec is a sweet bread with rum-soaked raisins and dried fruit and topped with slivered almonds. It's round with a cross on top, to represent Christ. And it is eaten throughout the Holy Week. My dad remembers making it in the small, hot kitchen of his childhood home in Miami. He and his five siblings would help their mother, and while the dough rose, they pocketed fistfuls of raisins and almonds from the counter. He says they ate mazanec as breakfast on Easter morning or as a dessert, with butter or raspberry or apricot jam. Pavla Velickinova, the head of the public diplomacy department at the Embassy of the Czech Republic in Washington, D.C., says mazanec is one of the oldest documented Easter foods in Czech history. It comes from the expression, "mazat," which means to anoint, she says. This is why it's baked on White Saturday, the day that reminds Czechs of the last rites of Christ. This tradition of making mazanec as an Easter treat dates back to the 15th century, says Karen Von Kunes, a professor of Slavic language and literature at Yale University. But even before that, she says, people across Europe baked this kind of bread around springtime. "In Europe, it was a custom to celebrate spring with making this ... type of pastry," she says. Some of those traditions are still alive in other European countries. Take England's hot cross buns for example, as well as Greece's tsoureki. Von Kunes says back then, most families would bake it during Easter. Poor families, who couldn't afford the sugar, raisins and almonds, would bake a single mazanec without those ingredients and share it among themselves. Wealthier families would make one for each family member. Growing up in the Czech Republic, Kristyna Montano says she remembers always buying the bread from stores. Every Czech bakery, big and small, sells mazanec during this holiday, she says. And her mother, who lives in the Czech city of Brno, has already been enjoying mazanec she bought earlier this week. Slices of mazanec made at home by Kristyna Montano, a Czech American now living in California. But Montano herself now lives in Redding, Calif., where she can't find it in a store. So, these days, she makes the bread herself. She eats it as a breakfast food all week with butter on top and hot cocoa on the side. Montano recently posted a video of her making mazanec on her personal food blog, where she regularly posts Czech recipes. While she works with her own recipe, which she has finessed over the years, others who make mazanec use recipes passed down to them by their parents. My dad uses a recipe from the cookbook given to him by his father. Nancy Vesecky, the owner of Vesecky's, a Czech bakery in Berwyn, Ill., uses the same recipe that was brought to Ellis Island by her husband's grandfather. Vesecky says she doesn't know of other bakeries that sell the bread. But for the Czechs and Czech descendants who come to her shop, she says it's something they like to buy. "A lot of people — it's a tradition for them," she says. "A lot of people like it. They put it in their Easter baskets, and they go [to church], and they have them blessed." Cecilia Rokusek, a Czech descendant who lives in the town of Davie, Fla., remembers coming home from the Good Friday church service as a child and having two rituals: coloring Easter eggs and making mazanec. And then it was a treat she ate for every meal continuing into the next week, sometimes in the form of French toast, if there were leftovers. It's not a difficult recipe, she says, but you have to dedicate time to it. Rokusek starts the prep for mazanec with soaking the raisins in rum. Then she kneads the dough and covers it with a tea towel and sets it aside. The next is boiling a pot of water on the stove and placing the pot in the lower rack of the oven, without switching the oven on. She then places the bowl of dough in the top rack of the oven, and lets it rise with the heat from the the pot of hot water below. Once the dough rises, she takes it out of the oven, kneads it some more and places it back inside the oven, with a fresh pot of boiling water underneath it. The dough rises again. She kneads it some more, then places it back in the oven, and repeats this two to three times. Making mazanec is clearly not for the lazy or for people running short of time. And that's a big reason why the tradition is struggling to stay alive in the U.S., says Rokusek. "I think time is a big, big, big issue right now. Everybody is working and they don't spend half a day in the kitchen baking." Still, she says it's important to share the recipe with future generations of Czech Americans. "I think it's important to ... keep the tradition," she says, "so that it doesn't get lost, even though you may not do it every year." Even my father, who went to buy ingredients for the bread Friday morning, doesn't make the bread every Easter. With a busy family, he hasn't always had the time. And most years, our Easter treats are the ears of chocolate bunnies and jelly beans. But he has made sure I know my last name is more than just a name; it's a celebration of Easter time, which is all the better with good food. And you can bet mazanec will make its way to my stomach this Easter, even if it takes us half a day to bake it. Cecilia Mazanec is a digital news intern at NPR. She is finishing up her undergraduate studies at the University of Florida.